Who ever heard of a "nuvistor?" Not me, that's for sure. If I ever used one, I didn't know about it. 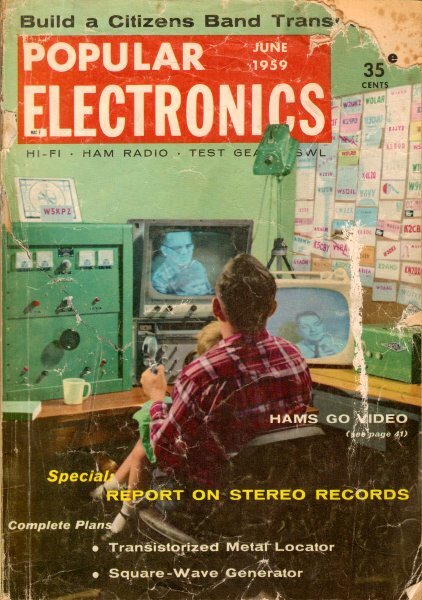 There is actually an entry in Wikipedia for the nuvistor that comports with the information in this article from the June 1959 edition of Popular Electronics. It was supposed to be a real paradigm changer, but alas, it never happened. RCA could have made billions off the concept. The other subject of this article on miniaturization, micro-modules, definitely did gain huge popularity. They are ubiquitous today in the form of multifunction hybrid modules, plug-and-play system elements, mixed signal ICs with stacked die, etc. If nothing else, I learned a new word today. A nuvistor was used in the front end of the HP3400A True RMS Voltmeter (thanks to Michael M. for that). Also, thanks to Bob Davis for pointing out that the Lafayette HB-400 CB radio sported a Nuvistor in the receiver front end. Here is a Nuvistor info resource. See the "Nuvistors and Micro-Modules," "The NASA 136," and Hitachi Nuvistor Advertisement, too. Three Nuvistors are shown beside their larger glass tube counterparts. 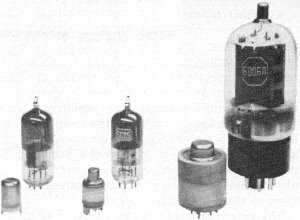 Left to right are developmental samples of a triode, tetrode, and beam power tube. Nuvistors outperform conventional types and make possible smaller, more efficient electronic instruments. Two developments which could shape the future of the electronics industry were recently announced by the Radio Corporation of America. One, a new type of vacuum tube called the "Nuvistor," comes from the laboratories of the RCA Electron Tube Division. The second, a new technique of integrating electronic circuits into "micro-modules," was engineered by RCA under a contract with the U. S. Army Signal Corps. The Nuvistor. A new concept in tube design, the Nuvistor is notable for several reasons. Roughly one-third the size of conventional tubes which perform similar functions, it employs a unique cylindrical type of construction which is ideally suited for mass production techniques. Materials used are ceramics, steel, molybdenum, and tungsten. 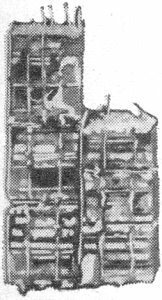 The Nuvistor uses no glass or mica in its construction. Electrodes are supported from one end in a cantilever fashion. This feature eliminates the need for mica support discs or spacers. Because of the low mass and shape of the electrodes, Nuvistors can withstand a high degree of shock and vibration. Tiny military radio has been made smaller than an average lump of sugar through the use of micro-module techniques. Advantages claimed are miniaturization, improved ruggedness, reliability, efficiency, and lower power drain. Nuvistors operate satisfactorily at temperatures in excess of those possible with conventional tubes. Another interesting feature is the inclusion of indexing lugs to Simplify insertion into tube sockets. It is expected that Nuvistors will be useful in industrial, military, and entertainment applications. Limited production will start next year. Future refinements include the possibility of incorporating the cold cathode design now under development by Tung Sol and the Signal Corps (see POPULAR ELECTRONICS, May, 1959). Micro-Modules. Developed primarily for military applications, micro-modules are nevertheless expected to find their way into industrial and entertainment equipment. Seemingly the end step in the trend toward miniaturization, they are composed of tiny wafers one-hundredth of an inch thick and a third of an inch square. These wafers, each of which is an electronic circuit component such as a resistor, capacitor, transistor, etc., are stacked, interconnected, and encased in a protective coating. The use of micro-modules makes possible no less than a tenfold reduction in size and weight of electronic devices. Tests indicate that the tiny cubes should be highly dependable, require little power, and provide high performance. It is expected that mass production techniques will lower their cost sufficiently to justify a "take-out-and­throw-away" repair philosophy. Micro-modules developed to date have all employed transistors. There is no reason, however, say RCA spokesmen, why they could not be combined with vacuum tubes, or Nuvistors, to offer functions not provided by transistorized circuits.